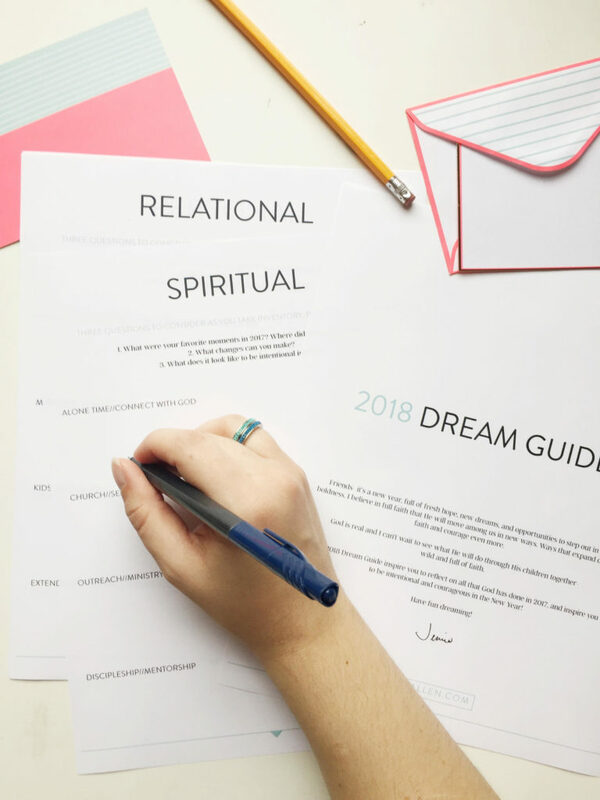 If you’ve followed the blog for a while, then you know the Dream Guide is one of my favorite tools to use every year. I created this a couple of years ago when I realized we all could use a simple guide to help us reflect and dream and pray as we head into a new year. Zac and I do this every year. We usually sit in our favorite chairs, or find a fun restaurant, we print out two copies, and we talk. We look back at the last year and forward into the new year. When I read my Bible, I see so many sacred moments of people pausing to worship and ask God's blessing over their next steps. Will you join us this year? Do it alone, text a friend, grab your spouse, your kids. We can ask things like: What if we could truly love people without fear of how they would receive us? What if we could give without needing anything in return? What if we actually began living our dreams instead of squashing them back into safer places? I hope this guide is as helpful for you as it has been for us. Submit your email below to get the latest Dream Guide in your inbox! Send me the Dream Guide! Thank you! Check your email inbox for your Dream Guide PDF. Steal away alone, with a good friend, or your spouse, and dream a little today or over this next week. Post photos of your time taking inventory and use the hashtag #dreamguide2018. I can’t wait to see how God moves you and challenges you!